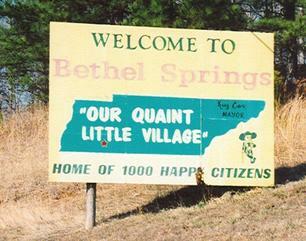 Bethel Springs is located in the northern part of McNairy County, Tennessee. The Bethel Springs Elementary faculty, staff, and community work together to promote appropriate behavior, paralleled with a safe, caring environment conducive to learning. BSES offers its students quality academic, athletic, and emotional growth. The administration, faculty, and staff are dedicated, committed, and capable in effecting the mission and the philosophy of the school. The rural atmosphere offers students an unpretentious locale, where teachers instruct in a personal scenario, taking advantage of a community-based school situation. According to the Bethel Springs Elementary School Evaluative Self-Study (1982), the school was originally a two story building constructed of logs. In 1895, the school was known as the Bethel Springs Presbyterian Academy and housed grades 1-12. In 1912 parents paid $1.50 per week to attend the academy. Most of this money was used to pay the teacher's salaries, however; if an insufficient amount was collected, merchants paid the remainder. The school has always had active parent involvement, and in 1925 the school had a "community club" which operated much like the present PTO. In 1926 Bethel Springs had the first graduating class of 6 students. In the spring of 1927, the community began building a new school. The principal donated his first year's salary of $1,500 for payment of the building, and the county paid the remaining amount. In the 1960's the building was constructed in three pods. The school consisted of open spaces without windows or walls, which followed the trend of the time. Two of the three pods were classroom areas, while the third served as a cafeteria. The gymnasium was build in 1935 and served as a place for physical education, ball games, and various school activities. "Old timers" boast of the 1950's evening when Elvis Presley performed in their gym. This building has since been replaced with a more modern gym, that has become the pride of all students, faculty, parents and community members. Bethel Springs Elementary was initially accredited with the Southern Association of Colleges and Schools in 1982 and has remained accredited throughout the years. Bethel Springs Elementary School was part of a major construction program in 1997. During that renovation the school gained a new gymnasium, new office spaces, and 12 new classrooms. Additional rooms were added for the 2010 - 2011 school year. The new construction provided six new rooms to meet the needs of the student population.